• The loan to Irish Continental Group represents the first support approved by the EIB under a new Green Shipping financing initiative that supports investment in new and existing ships to reduce emissions and improve fuel efficiency. • The W.B.Yeats ship incorporates emissions scrubber technology to reduce sulphur oxide pollution and ballast water systems which meet current and known future environmental regulations and will deliver optimal fuel consumption and efficiencies. The European Investment Bank is providing EUR 155 million to finance two new passenger and vehicle ships for the ICG subsidiary Irish Ferries. The two ferries will increase passenger and cargo capacity on routes to Ireland, replace older and smaller vessels and significantly reduce emissions from the Irish Ferries fleet. The new ferries are expected to be used on both the Dublin-Holyhead and Dublin-Cherbourg routes to reflect demand for a greater choice of services from Ireland to Britain and direct to continental Europe. The largest ever EIB support for Irish shipping was announced during a visit this morning by Andrew McDowell, European Investment Bank Vice President and Eamonn Rothwell, CEO of Irish Continental Group. The latest addition to the Irish Ferries fleet, the new W.B.Yeats, was partly financed using EUR 75 million from the EIB. The W.B. Yeats can transport 1,800 passengers, 300 cars and 165 trucks and following delivery in December, commenced sailings today on the Dublin-Holyhead Route. The second ship, expected to be completed in 2020 and unnamed as yet, will likely transport 1,800 passengers and crew and 1,526 cars or 300 trucks. 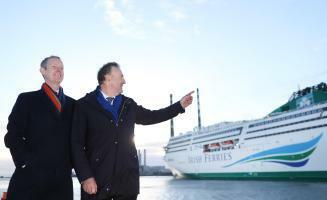 The new ships have been designed to enable flexible use on all existing Irish Ferries routes between Irish, British and French Ports and the vessels will be used to reflect the increased tourism and freight demand.